In The 1980s 3D Glasses Were Marketed As A Solution For? There’s no end to the number of gimmicky and dubious weight loss diets, tricks, and tools on the market, but even among dubious dieting tools there are those that stand out. Back in the 1980s, a mail-order company in California ran ads in magazines across the U.S. advertising their “Star Vision Dieter” glasses (and depending on the target audience of the magazine you’d be charged anywhere from $9.95 to $39.95 for the product). What exactly was the product? 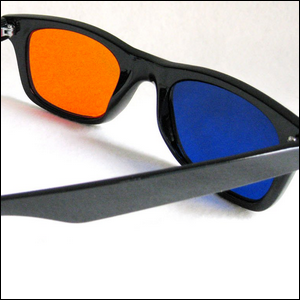 The Star Vision Dieter glasses looked a whole lot like 3-D anaglyph glasses and featured an orangish-red lens and a blue lens. The whole premise of the glasses was that by wearing them your color perception would be thrown off and you would be less hungry because the food looked less appealing. There were even claims made that the effects lasted after you took the glasses off. Not only were the claims unfounded on every level, but a diet tool that makes all food look unappealing (and has lasting effects after the tool is no longer used) sounds like an absolutely awful diet trick. After investigation by the Post Office (due to the mail-order nature of the company), the product was discontinued and dieters everywhere could resume using diet tricks that didn’t require they look like they got lost on their way to see Jaws 3-D.